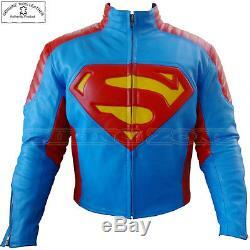 SUPERMAN MOTORBIKE LEATHER RACING JACKET WITH CE CERTIFIED PROTECTIONS. Brand New Mens Cowhide Leather Motorbike Customised Racing Jacket. Customers can order jacket on its own or two piece suit. Matching shoes and gloves can also be ordered. Customer can also have this style made as a fashion wear without armours. · 100% genuine mild grain 1.1 1.2 mm cowhide leather. Mash lining with removable protector pockets. Heavy duty zippers to attach jacket to the trousers. · Original YKK zippers for durability. Additional padding for safety on critical parts. Two inner mobile and wallet pockets. The premium naked leather is an upgrade to our standard leather which is even more softer, thicker in gauge, much more durable and near to leathers natural form. 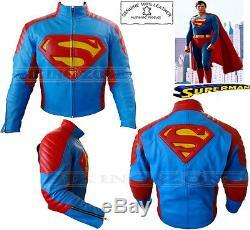 Customers can also order any jacket or suit of their own choice of designs or replicas. To help for sizing, please see table below - The measurements structure of the size chart in the table is our company's own personalized and are just for your reference. It could not be referred or compared to any other sizes such as UK, European, USA sizes etc. Please make sure that you take your exact body measurements with measuring tape and do not leave extra inches loose (except not to take too tight measurements) as we will add the extra inches ourselves accordingly. Imagine you adding inches and than us adding further inches, this will create chaos. If you require wearing bigger garments such as jumpers, jeans etc underneath, please let us know so that we keep further loosing appropriately. We also suggest you to take measurements on your skin, in your under garments or thin clothings to get accurate sizes. Suitable for person with chest size. Bust / Chest (A): Measure around the fullest part of your chest passing the tape loosely under your armpits. Measurement tape shouldnt be too loose or tight. Sleeve (B): Measure your sleeve from your shoulder joint to your wrist. Waist (C): Measure around your waist over your naval / belly button part. Hip Bones (D1): Measure around the widest part of your hip bones. Buttocks (D2) Measure around the widest part of your bum. Thigh (E): Measure around the widest part of your thigh. Inside Leg (F): Measure from your crotch to ankle. Complete Height (G): Head to toe. The inside length can be altered according to your in-leg measurements and height. Please could you also confirm the following info. Where about on your belly do you wear your trousers i. Around naval, below naval or above naval. And what does that area measure? What size trousers / jeans do you normally wear? Also, if you don't have a problem, could you attach a recent pic of yourself to the order which will enable us to shape the suit according to your body structure. A mobile pic from neck to toe would do the job. ORDERING MATCHING SHOES AND / OR GLOVES. Following are the specification of our matching boots. 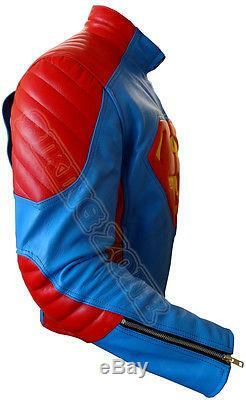 Outer shell: Durable, high tech lorica outer construction offering high level of flexibility. Protection: molded plastic shin, ankle heel, back support & TPU shift pad. Slider: Molded plastic replaceable toe slider. Our gloves are made of fine quality cowhide analene leather and its protections are made of original Kevlar protection construction. Shoes Size (USA): 7, 8, 9, 10, 11. Shoes Size (Europe): 41, 42, 43, 44, 45. Gloves Size: XS, S, M, L, XL, XXL. We make customized jackets and suits which means we will manufacture jackets and suits according to your given measurements. These charts only show what measurements come under which sizes and it also helps customers to understand how much they have to pay if their sizes are below 2XS or above 2XL. There will be extra charges for jackets and suits smaller than 2XS or larger than 3XL i. Extra charges for jackets and suits larger than 4XL i. Extra charges for jackets and suits larger than 6XL i. These apparels are manufactured from our manufacturing unit overseas, mainly in Asia. Our warehouse in UK is not open for public, however, we provide clear measurement instructions and one to one guidance to each customers, where required, for a perfect fit. The items made on order only are not stored in the warehouse. They are dispatched directly from the manufacturing unit overseas. Following additional information is needed for courier purposes. Contact Telephone Number (landline or mobile). Please note that we will not start production of anything unless we receive clear funds and complete sizes are confirmed with you. This is maximum time limit; you may receive your items quite earlier. However, this time may increase in case of deliveries to South America, Mexico, Russian Federation and Israel. So please customers from these countries give us a little bit extra time to get their items delivered to them. We have the right to refuse / cancel an order if the customer is not willing to co-operate. 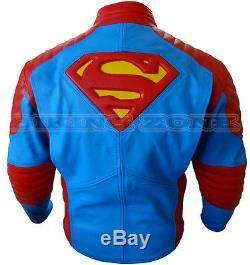 The item "SUPERMAN STYLE CE ARMOUR MENS MOTORBIKE / MOTORCYCLE COWHIDE LEATHER JACKET" is in sale since Friday, April 17, 2015. This item is in the category "Vehicle Parts & Accessories\Clothing, Helmets & Protection\Motorcycle Clothing\Jackets".zone" and is located in SLK. This item can be shipped worldwide.